Ladies never have enough shoes. They have a pair of heels for everything, regardless if it’s casual, smart casual, formal, semi-formal or any other type of mixed event. Long story short, if you check their shoe closet, you will see entire stacks of shoes, many of which they haven’t worn in ages – but they still won’t let go of them. Men, on the other hand, don’t really bother with such things. All they know are three pairs of shoes: sports, casual, and formal. 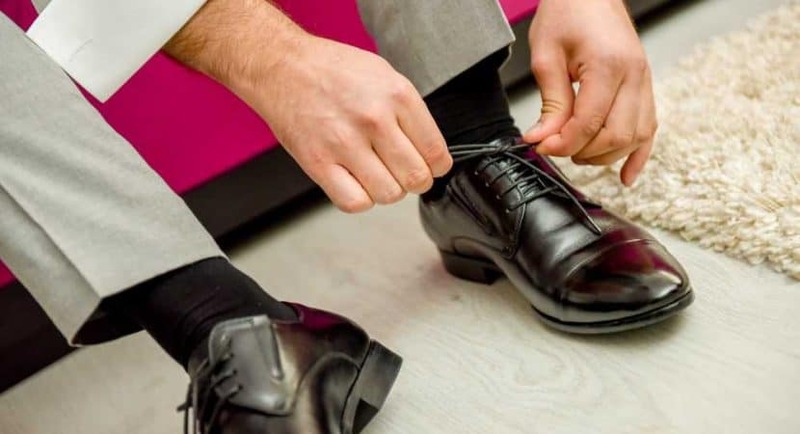 If you are not one of those men who prefer wearing sneakers or boots on a normal day, the chances are that you will go for a pair of dress shoes. Why? Because they’re comfortable, and you can easily mix them with casual or formal outfits – provided they are the right color for the event. 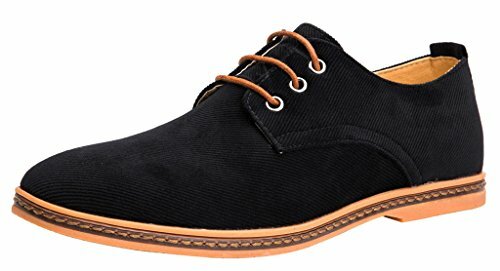 With this in mind, we are going to review 4HOW Mens Casual Oxford Dress Shoes, the casual, suede leather model. They’re a great choice for those who are looking for something stylish – while staying comfortable and non-conformist. The first thing you will notice about these shoes is the fine, suede leather. Rather than using plain full-grain leather, this design is perfect for those who want to take out the shine. It’s the ideal pair of shoes that will not attract much attention, but at the same time will be appreciated once they are noticed. The beauty of suede is that it does not need the intensive maintenance required by full-grain leather shoes. These shoes will only need a few brushings every now and again to remove the dirt, making maintenance fairly simple. The sole is made from durable, man-made rubber that will absorb the shock caused by stepping impact. The pattern on the bottom of the sole is a special, non-slip one that will prevent you from losing your grip on the ground. You can go fast, or you can go slow – but regardless of the surface of the ground, you shouldn’t slip. Considering the soft insole, it will be difficult to find a pair that is more comfortable than the 4HOW one. The inner lining is made of durable fabric that will let your foot breathe properly – even when the temperatures are high. Depending on your preferences, you can find this pair of suede dress shoes in three colors: black, brown and blue. All of the hues are dark, so they can be worn with most clothes – regardless if we’re talking about jeans or a smart casual suit. The round toe is perfect for those who dislike the “too formal” narrow toe. The Oxford design mixes well with semi-formal events, and you can easily wear them straight from work to a night out with friends. The tightness of this shoe is adjusted thanks to the closed lacing that goes through three rows of holes. The shoelaces themselves are durable and fashionable, and you will not have to worry about them breaking or losing their form anytime soon. Despite the fact that the 4HOW Mens Casual Oxford Dress Shoes do not require a lot of maintenance, you still need to be particularly careful while cleaning the suede leather. It may not require constant shoe polish, but you will still have to brush it and keep it clean – while being particularly careful of the strokes. One wrong stroke, and you’ll be leaving unsightly marks on the shoe. At the same time, maintaining a pair of 4HOW suede leather shoes is significantly easier than a pair of Asher Green calf leather two-tone dress shoes. Not only is suede less expensive, but you will not have to polish them each time you get out of the house. The matte look will mark any imperfection, and unless there is visible dirt, you will only have to clean them once every two or three times they’re worn. Plus, these shoes are perfect for a casual night out with friends, without having to go all out on flashy designs. A pair of dress shoes such as the Amali metallic splatter slip-on dress shoes, for instance, would be perfect for a night out in the club. However, if you decide to go to a pub, a restaurant, or casually hang out for a drink, then something such as the 4HOW would be more appropriate. While these shoes might not be fully formal, you can still wear them with 80% of your outfits. They might look odd when worn to a wedding, but they will look perfect for a casual night out with co-workers or friends. Plus, you can easily wear them for a whole day without problems. They may not have such a great arch support, but they are still some of the most comfortable dress shoes out there. Compared to most dress shoes – leather or not – the 4HOW pair are also much more affordable. For a very low price, you get durability, as well as the looks and quality that will make you the center of attention. They are definitely something worth investing in if you prefer versatility over everything else since they can replace most of the casual shoe designs.